SEOUL, South Korea — The office of South Korean President Moon Jae-in responded sharply Tuesday to a conservative lawmaker's accusation that he was acting as the "top spokesman" of North Korean leader Kim Jong Un. The Blue House said the comments by Na Kyung-won, floor leader of the Liberty Korea Party, were an insult to both Moon and South Koreans wanting peace and it demanded an apology. 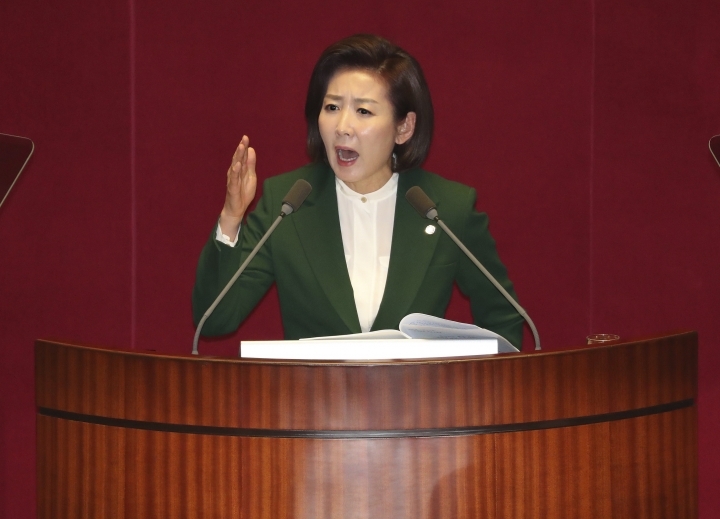 Na's speech at the National Assembly in Seoul was interrupted for about 20 minutes after legislators from the ruling liberal party reacted angrily to her comments, approaching the podium and engaging in shouting matches with opposition lawmakers. "Do not waste energy that should be used for the country on insulting (South Korean) people and the head of state," the Blue House said in its statement. "The Liberty Korea Party and floor leader Na should bow in apology to the people who yearn for the complete denuclearization of the Korean Peninsula and permanent peace and prosperity." Na said Moon's outreach to Pyongyang and proposals to restart inter-Korean economic projects banned under U.S.-led international sanctions are causing a rift with Washington, which has called for allies to maintain economic pressure until North Korea takes firmer steps toward relinquishing its nuclear weapons and missiles. She demanded Moon overhaul members of his security and diplomatic team and withdraw the appointment of Kim Yeonchul, an outspoken supporter of inter-Korean rapprochement, as his new point-man on North Korea. "Please ensure that we never again hear the embarrassing talk that the president of the Republic of Korea is the top spokesman of Kim Jong Un," said Na, referring to South Korea by its formal names, as lawmakers from Moon's party began shouting at her. Na said she borrowed the expression from "foreign wires," apparently referring to a Bloomberg report last September that described Moon as acting as Kim's "top spokesman" at the U.N. General Assembly. Moon's Democratic Party said it plans to refer Na to the Assembly's ethics committee over her speech that "polluted" the parliament. Moon, who is currently on a three-nation tour in Asia, arrived in Malaysia on Tuesday for a state visit. Moon has prioritized stabilizing bilateral relations with North Korea amid the larger nuclear negotiations and held three summits with Kim last year where they agreed on steps to reduce conventional military threats between the countries and restart inter-Korean economic projects when possible. Moon also lobbied hard to revive nuclear talks between Washington and Pyongyang, which resulted in two meetings between Trump and President Donald Trump. Trump and Kim's second meeting in Vietnam last month collapsed after North Korea rejected ambitious U.S. proposals to discard its entire nuclear weapons and missile programs in exchange for the removal of all sanctions. Experts say the breakdown of the Trump-Kim talks raised further doubts about Moon's claim that Kim is genuinely interested in dealing away his nuclear weapons and about Moon's role as mediator, which has also become less crucial with Washington and Pyongyang directly communicating. Moon's calls for partial sanctions relief to encourage nuclear disarmament steps by North Korea has caused disagreements with Washington, which does not want to give up what it sees as its main leverage with the North. A senior State Department official told reporters last week that Washington isn't considering sanctions exemptions for inter-Korean economic projects.